How many times do you hear that Breakfast is the most important meal of the day? Possibly very often. I have no doubts that this is true, but skipping breakfast is something I never ever do, purely because the thought of food is the main thing that gets me out of bed in the morning! 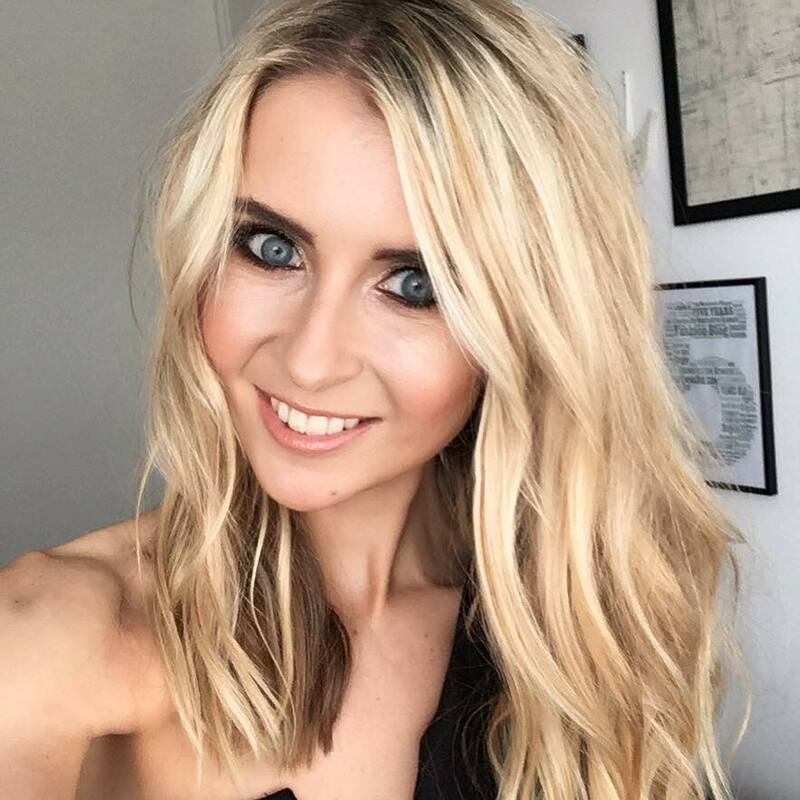 I’m a pretty simple girl – I’m a Weetabix with soya milk and a mug of lemon hot water kind of person, every morning without fail. The only problem with this is that it’s not the most filling of breakfasts, and as I get up at 6am and eat breakfast straight away, come 10am my stomach is rumbling like crazy. 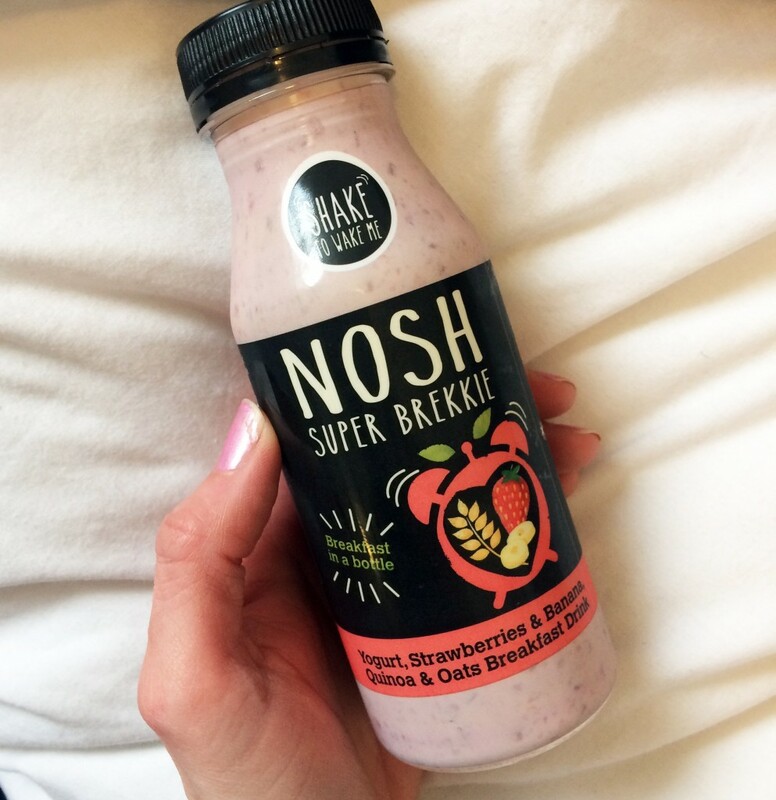 I was recently introduced to NOSH: a new super brekkie bottled up to have on-the-go. Maybe this is the ideal addition for me whilst I’m walking to work? 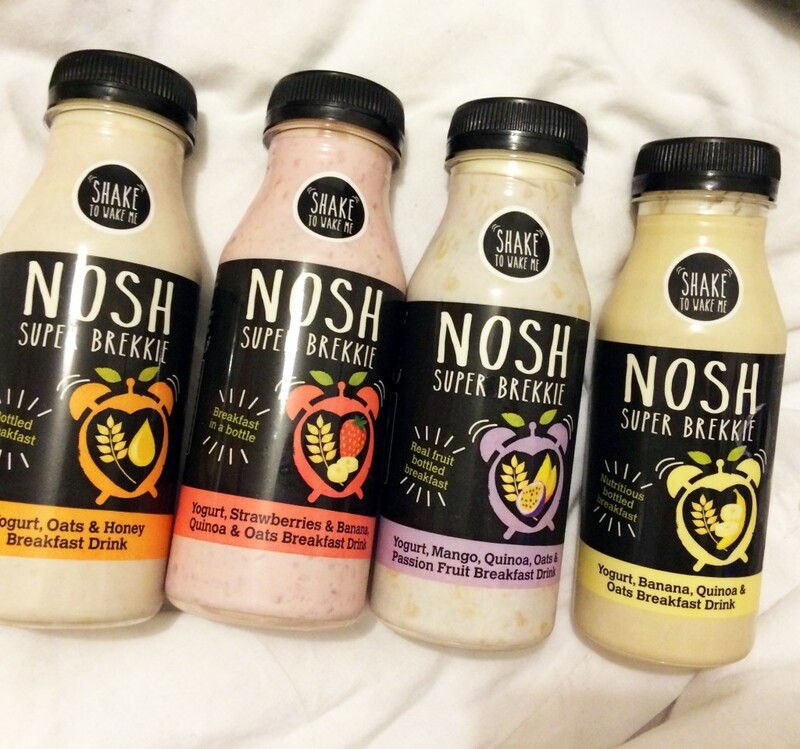 NOSH is a lovely little unique product, as it includes superfood quinoa, yoghurt, real fruit pieces and whole oats, and comes in four yummy flavours, delivering on both taste and health credentials. It’s a low-fat source of protein, and has no added sugar or preservatives. I’m always really cautious about sugar content in foods, and although fruit is naturally high in sugar, it’s a natural source, so NOSH doesn’t contain all the added rubbish that many breakfast cereals contain. This does lead me on to politely warn everyone about Muesli – I know so many people who consume this cereal everyday and it’s sugar content is ridiculously high, not with the natural sort either. Muesli does have it’s goodness, but it’s a baddie when it comes to sugar so I really would limit how often you have it to start your day if you are slightly health conscious. Back onto NOSH. I am a huge oat lover, and as this breakfast in a bottle combines oats with creamy yoghurt, quinoa and fruit, it has a thick smoothie texture but also feels a little like a meal too. The founder of NOSH says that the team like to call it a ‘foothie’ – a food you drink or a drink you eat. So expect to be kept feeling full up until lunchtime. My favourite is the Banana Porridge flavour (I am banana crazy though) second to Honey & Oat… although I could pick them all! They are seriously yummy, and tasting the chunks of real fruit gives these a juicy kick. I would put this super brekkie in a bottle forward for those with busy lives, who need to eat breakfast on the train or whilst walking to work. The brand is fairly new to the UK, and is now on sale in Tesco, Holland and Barratt and Camden Food Co. stores nationwide with an RRP of £2.50. Given the health benefits and its value from money, I’m loving NOSH!